As Democrats across the country make an election-year push to raise the minimum wage, they often point to fast food workers, baristas and others who are struggling to raise families, pay rent or get through school — some on as little as $7.25 per hour. Looking to motivate younger people, minorities and others in their base to go to the polls on Nov. 4, the party has put questions on the ballot in five states asking voters whether the minimum wage should be increased. The issue is also a near-constant topic on the campaign trail, as Democrats work to identify themselves as stalwarts for the middle class and to paint Republicans — who typically oppose raising the wage because they say it will lead to job cuts — as uncaring. In one state, Illinois, the campaign to support the minimum wage would not actually raise the wage. The ballot question is non-binding and would only ask voters their opinion. Illinois Democrats are fighting to keep control of one of the party’s last strongholds in the Midwest. Gov. Pat Quinn, with backing from labor unions, has hit his wealthy Republican rival repeatedly for earlier statements that he wanted to cut and even eliminate the minimum wage, calling him an “out-of-touch” multimillionaire. Quinn also spent a week trying to live on a minimum wage budget and talking about the experience on the trail. While the Chicago Democrat said he ate Graham Crackers for dinner and had to order water instead of drinks when dining out, he also managed to catch country artist Garth Brooks during the first stop of the musician’s tour. The wage measures are found in other states with hard-fought races, including Alaska and Arkansas, where the outcome could determine whether Democrats keep control of the U.S. Senate. The party also is battling to pick up a congressional seat in Nebraska and keep a Senate seat in South Dakota. Durbin said Democrats have been “victimized” in the past when Republicans put their own turnout-stoking measures like gay marriage bans on the ballot in conservative states. Quinn’s opponent, Bruce Rauner, is among the Republicans accusing Democrats of playing games with the wage issue. “If he was serious about this, he could have gotten it done” in the Democratic-controlled Legislature, Rauner said. Quinn says he hopes an overwhelming vote in support on the ballot measure will persuade reluctant legislators to approve an increase. 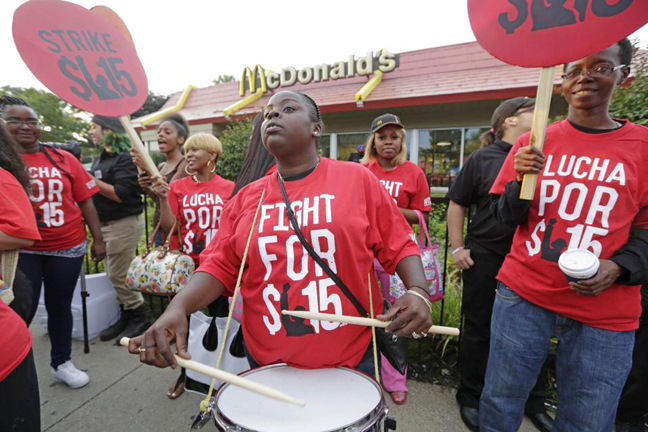 The impact of raising the minimum wage has been much debated over the years. A report by the Congressional Budget Office in February estimated that a federal minimum wage of $10.10 an hour, which President Barack Obama supports, could cost 500,000 jobs nationwide. But the 13 states that raised their minimum wages at the beginning of 2014 were adding jobs at a faster pace than those that did not, according to a Labor Department analysis in July of state-by-state hiring data. Minimum wage proposals tend to be popular even in conservative states, said John Matsusaka, a University of Southern California economist who studies public ballot issues. All 10 of the statewide measures considered since 2000 have passed, he said. Although ballot initiatives generally increase turnout by about 1 or 2 percent, Matsusaka said, it’s less clear how they affect candidates on the ballot. The popularity of the issue has put some Republican candidates in a difficult spot. In Alaska, Senate candidate Dan Sullivan opposed a federal minimum wage hike during the GOP primary campaign then came out for the state minimum wage measure in his general election race against Democratic Sen. Mark Begich. Democratic Sen. Mark Pryor and his Republican opponent, Tom Cotton, have both endorsed the state-level ballot measure in Arkansas, but Cotton had previously said the issue should be left for voters to decide. Democratic officials in Nebraska hope the wage issue makes a difference in the close race between Democrat Brad Ashford and Republican incumbent Lee Terry in an Omaha-based congressional district. In South Dakota, where Democratic U.S. Sen. Tim Johnson’s retirement created an open seat, Democrat Rick Weiland helped carry signed petitions to the Secretary of State's office to get the minimum wage issue on the ballot. His GOP opponent, former Gov. Mike Rounds, opposes it. In Illinois, Rauner admitted he'd made a mistake after video surfaced of him saying he was “adamantly, adamantly against” increasing the minimum wage. Rauner now says he supports an increase to $10 per hour, as long as it's accompanied by pro-business reforms, but the shift hasn’t stopped Quinn from airing ads featuring video clips of the Republican’s earlier comments. Associated Press writers Grant Schulte in Lincoln, Nebraska and Nicholas Riccardi in Kodiak, Alaska, contributed to this report.